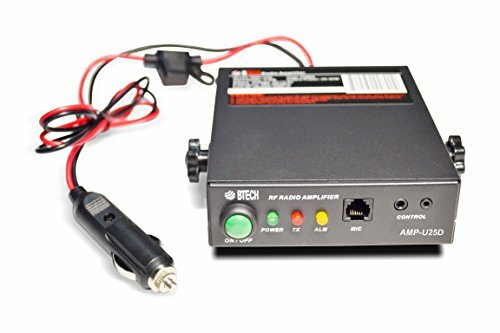 The BTECH AMP-25 Series is designed to work with any BaoFeng or BTECH handheld transceivers, but it will also work with any handheld radio that outputs 2 W - 6 W with the appropriate cable. With the included Radio to Amplifier RF Cable, the amplifier will also work with Wouxun transceivers, some TYT transceivers, and some Kenwood transceivers. If the supplied cables do not connect to your radio, you will need to use adaptors or build cables with the appropriate connectors. Your BTECH AMP-25 amplifier does not include an antenna. It is very important to not transmit without an antenna or dummy load connected to the ANT connector on the rear panel of the amplifier. Transmitting without an antenna or dummy load may cause harm to the radio equipment. When choosing an antenna, make sure that it is suitable for the bands you plan on transmitting and receiving on. For example, if you plan on transmitting on 145MHz, make sure that the antenna you select has an SWR of 1.5:1 or less on that frequency. Using an antenna with an SWR greater than 1.5:1 could damage the amplifier. If you plan to use a magnetically-mounted (mag-mount) antennas, ensure that the antenna is grounded to a metal surface, such as a vehicle body. Magnetically-mounted antennas do not operate properly without a good ground. Easily extend the communication range of your handheld radio; Use the AMP‑U25D to create: an affordable DMR mobile radio with a vehicle mounted antenna, a high power field radio with a field deployed antenna, a home/base radio attached to a mast. Your handheld radio connects in seconds and can just as easily disconnect and be taken on the go. Kit Includes the necessary cables and interface connectors to easily connect to BTECH and BaoFeng Radios. Recommended Accessory: Pair with the BTECH UT-72 Antenna or NMO-72 Antenna & compatible mount for an easy mobile or field deployed solution.